That’s an extract from the marketing page of the business school I applied to, and I’m sure you’ve been reading similar, to be frank, dull descriptions when applying to a school or doing research on behalf of your loved ones. What makes education marketing often so boring and what are the key challenges? One of the key challenges of education marketing strategy is that the same content is served to multiple audience segments, all of them with very different expectations and needs. Educational organisations are often, at least partly, funded by the government, and require high-level documentation on the subjects and the goals of the study programme. On the other hand, educational organisations are competing over talent for courses and joining research groups, and the marketing page should list the key topics that will be studied over the years and the future research themes. 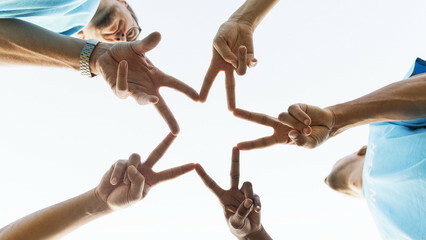 Finally, the marketing team needs to address a young audience and their parents to attract prospective students – the marketing page should concentrate on providing an overview of student life, key skills acquired during the studies and the concrete benefits of graduating in the specific subject area. The same content served to different target groups leads to an average marketing campaign and poor results. Second, the expectations of what’s good marketing are transforming. Generation Z, consisting of teens born in 1995 or later, values authenticity and students are naturally sceptical about advertising. They are active on social channels and messaging platforms, and expect brands to be available there too. Generation Zs want to be co-creators instead of passive consumers. The third, and the most crucial, challenge is the change of expectations on how to develop new skills and what students expect educational institutions to provide. Generation Z is a lot more entrepreneurial, and cares less about diplomas – if they can acquire skills through non-traditional route, they’ll take the opportunity. According to James Casap, Education Evangelist at Google, Generation Z expects schools to help them to develop skills in solving a particular problem instead of answering the theory about what they want to be when they grow up. 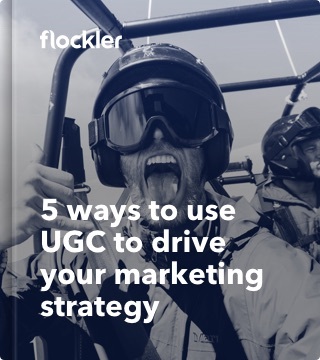 How can UGC help universities and colleges to engage students, staff and other stakeholders? 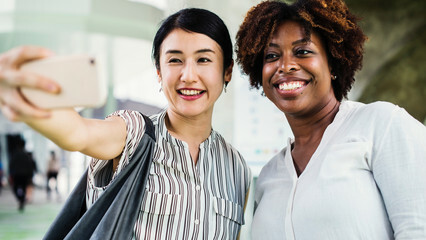 Word-of-mouth and authentic recommendations by our peers are the most effective marketing, and education marketing makes no exception to the rule. Whereas no more than five years ago prospective students would participate in the Open Day organised by the school to hear experiences and feedback from the current students, today they get authentic information through YouTube, Facebook, Snapchat and many more; the information is delivered unfiltered and in real-time. It means that educational organisations are no longer able to completely control marketing messages. Instead, marketing is co-created with the audience and transforming over time. However, building the relationship with the audience and engaging people to create content will help to adjust the rhythm of the beat played on social channels. Are you already engaging students and other stakeholders in creating content? Authentic and inspirational content attracts prospective students – real-life examples of coursework shows the problems current students are solving during their studies, and how well it prepares them for their future careers. 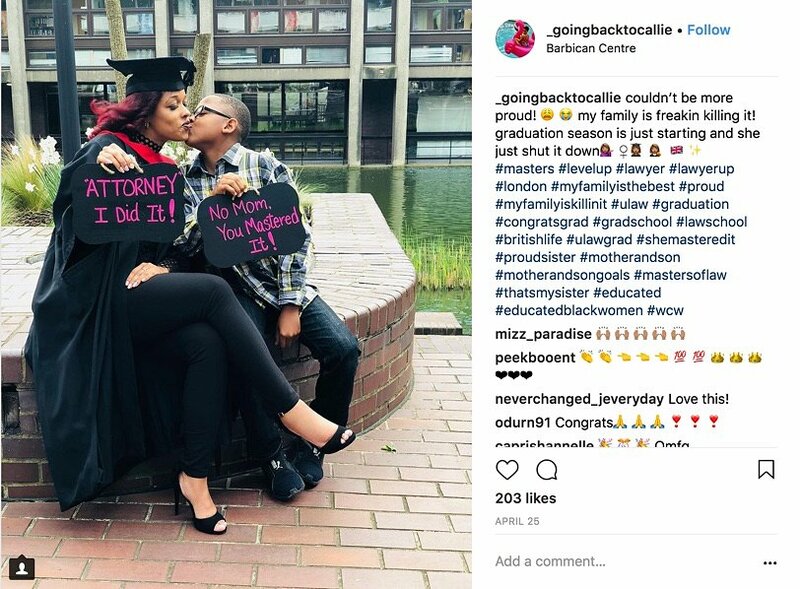 #WeCreate by University for the Creative Arts is an excellent example of a successful education marketing campaign in 2018. The site features content promoting the achievements by their students and the daily life in the campus. However, it’s not all about the life on campus. To the most of us selecting the university means much more than picking the field of study – it often means flying the nest and moving to a new city. 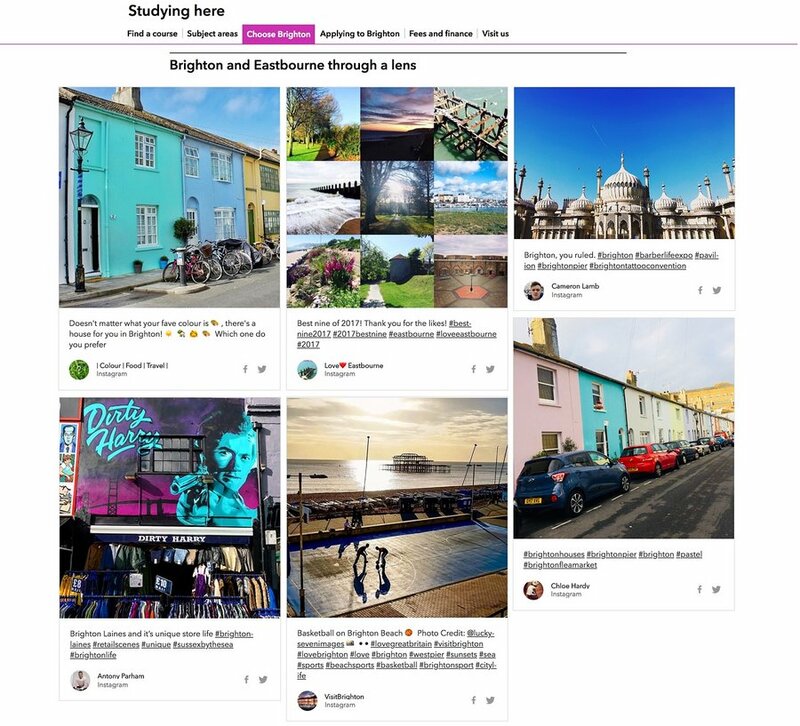 That’s why the University of Brighton’s marketing page for prospective students features things to do in the city of Brighton and Eastbourne area. The University of Brighton is creating the content themselves? 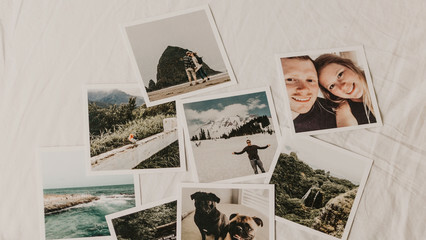 No way; YouTube and Instagram are full of inspirational travel content, and with social media aggregation tools like Flockler, it’s easy to gather and display social content in one place. If you’ve been following the latest news on social media marketing or you are responsible for content published on Facebook, you might have noticed organic reach and engagement going down? 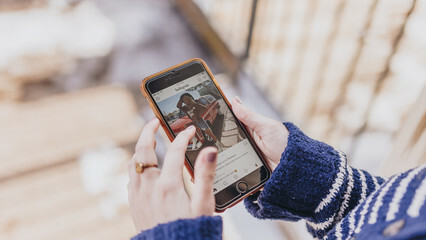 The algorithms of social media giants prioritise the content shared by our friends and family, thus decreasing the visibility of branded content. The best way to increase the reach on social channels? Engage your audience and encourage people to create content - and chat with their friends mentioning your branded hashtag and username. That’s precisely what the University of Law is doing with #LiveProspectus hashtag. 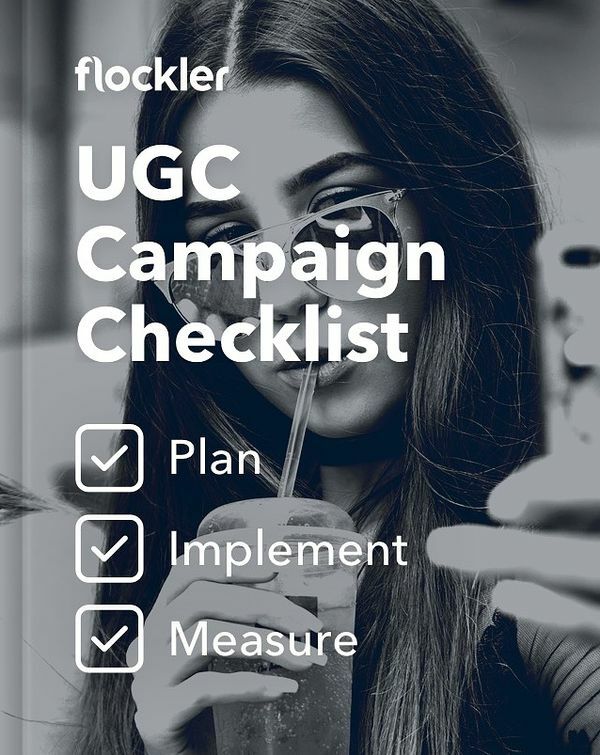 In addition to higher reach and engagement through personal social media accounts, the #LiveProspectus website built with Flockler gathers together the content shared by the university and students in social media. Creating long-form content is time-consuming and Generation Z-ers, multi-tasking between different apps and activities, have a shorter attention span than previous generations. Social hubs mixing snackable social media content and blog posts are a great one-stop-shop and go-to resource for students and their parents, staff and other stakeholders who’d like to stay up-to-date on the latest news and events. "Well initially, it was that the regular newsletter being emailed out to students wasn’t getting any traction. A survey that was carried out showed that the students had either little or no knowledge of it. This was a huge issue because it was a central point of the communication containing lots of relevant and interesting information. Now with the Flockler hub, awareness among students is up to around 30%. Flockler lets us bring all student news and events listings into one place."